This simple gold necklace features the word PEACE in script writing. Each necklace comes on a gold chain. This simple silver necklace features the word TRUTH in script writing. Each necklace comes on a silver chain. This simple gold necklace features the word WISH in script writing. Each necklace comes on a gold chain. Silver Tone, Green Acrylic & Natural Shell, Beige Cord, Fish Hook (earrings), Sea Life, Starfish Pendant Adjustable Necklace & Earring Set. Pendant 1 1/4" X 1 1/4". Earrings 3/4" X 1 1/4". Light Green Pearl Look Acrylic Seed Beads Multi Strand Necklace & Earring Set. Length 20 1/2" + extender. Earrings 2 1/4" with 1" drop. Gold Tone Green Semi-precious Stone Pendant Long Necklace. Length 29" + extender. 7/8" X 1 7/8". Gold Tone, Hematite Druzy Acrylic & Black Diamond Glass Crystal Pendant Necklace. Length 16" + extender. Pendant 1 3/8". Hematite Tone Blue Glass, Post (earrings), Necklace & Earring Set. Length 18" + extender. Earrings 3/4" with 1" drop. Hot Pink Epoxy Sea Life Dolphin Tail Pendant Necklace. Length 17" + extender. Pendant 1 1/8" X 1 1/8". Approximately 4.75" diameter. Lobster claw clasp with 3" extender. 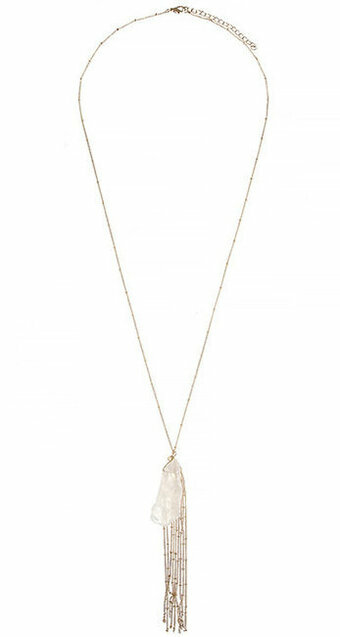 Gold Tone Light Pink Semi-precious Stone Pendant Long Necklace. Length 29" + extender. 7/8" X 1 7/8". Approximately 30" length. Lobster claw clasp with 3.0" extender. Earrings: Drop Approximately 1.5". Fish Hook. Length approximately 24" with 3.3" extender. Lobster claw clasp. Approximately 22" length. Lobster claw clasp with 3" extender. 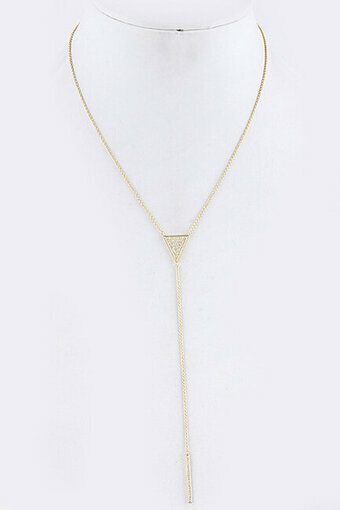 Matte Gold Tone Delicate Butterfly Necklace. Length 17 1/4" + extender. Pendant 1/2" X 1/2". 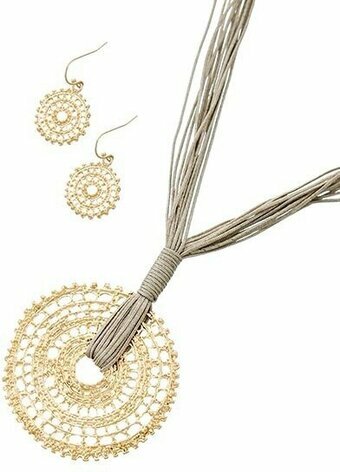 Matte Gold Tone, Grey Cord, Fish Hook (earrings), Multi Strand Pendant Necklace & Earring Set. Length 17" + extender. Pendant 3" diameter. Earrings 1 1/4". Matte Gold Tone Ivory Cord Fish Hook (earrings) Toggle Closure Multi Strand Pendant Necklace & Earring Set. Length 15" - 20". Pendant 2" X 2 5/8". Earrings 1" X 1 3/8". Matte Gold Tone, Metal, Fish Hook (earrings), Pendant Necklace & Earring Set. Length 16 1/2" + extender. Pendant 1 3/4" X 2 3/8". Earrings 1 3/8". 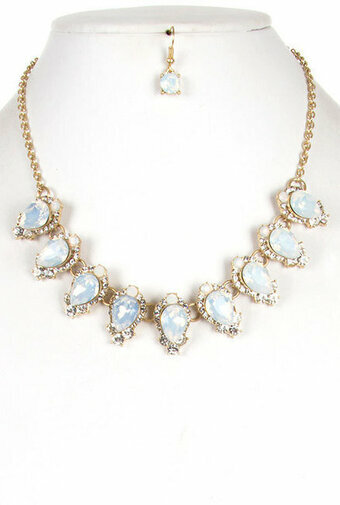 Matte Gold Tone White Opal Acrylic, Post (earrings), Flower Pendant Necklace & Earring Set. Length 17 1/2" + extender. Pendant 1 3/8". 5/8" diameter. Length approximately 20.4" with 3.4" extender. Lobster claw clasp. Earring post stud back. Mix and Mingle sterling silver plated mesh rope necklace. 19 inches. 3mm thick. 1 piece per package. Length approximately 16.4" with 3.1" extender. Lobster claw clasp. Fish hook ear wire. Mustard Wood Fish Hook (earrings) Necklace & Earring Set. Length 19 1/2" + extender. Length 1 3/8" with 1" drop. Length 17 3/4" + extender. Earrings 1 1/8" x 1 3/4" with 1 1/4" drop. Olive Acrylic Seed Beads & Mother Of Pearl, Fish Hook (earrings), Necklace & Earring Set. Length 23" + extender. Earrings 1 1/4" X 1 3/4" with 1 5/8" drop. Orange & Light Blue Epoxy, Post (earrings), Sunburst Pendant Long Necklace & Earring Set. Length 35 1/2" + extender. Pendant 2 1/2" diameter. Earrings 1/4" diameter. Approximately 16" length. Lobster claw clasp with 3" extender. Earrings: Drop Approximately 1.0". Fish hook. Necklace: Approximately 26" length. Lobster claw clasp with 3" extender. Earrings: Drop Approximately 1.25". Fish Hook. 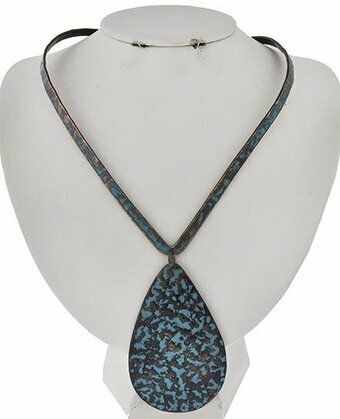 Patina, Metal Choker Style Necklace. Length 15". Pendant 1 7/8" X 3 1/4". Patina Metal, Brown Cord & Turquoise Stone, Fish Hook (earrings), Multi Strand Flower Pendant Necklace & Earring Set. Length 17 3/4" + extender. Pendant 2 1/4" X 2". Earrings 1". 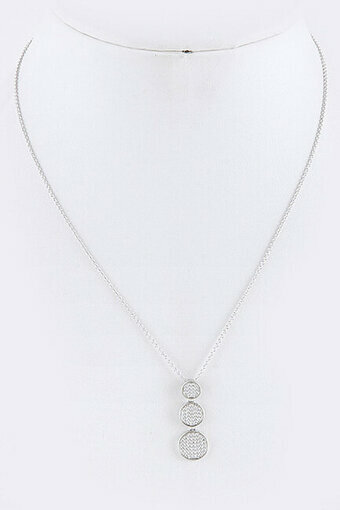 Pave Cubic Zirconia Triangle Bar Pendant Necklace Set. Approximately 16" length. Lobster claw clasp. Approximately 16" length. Lobster claw clasp. Length approximately 17" with 3" extender. Lobster claw clasp. Fish hook ear wire. Necklace: Approximately 21" length. Lobster claw clasp with 3" extender. Earrings: Drop Approximately 0.2". Post Back. Peach Acrylic Seed Beads & Mother Of Pearl, Fish Hook (earrings), Long Necklace & Earring Set. Length 32" + extender. Earrings 1 1/8" X 1 7/8" with 1 1/2" drop. Earrings: Drop Approximately 2.0". Fish hook. Length approximately 16.4". One size fit. Purple Acrylic, Fish Hook (earrings), Graduating Multi Row Necklace & Earring Set. Length 20" + extender. Earrings 1 3/8" with 2 3/4" drop. Worn separate or layered together, these coordinated necklaces from our Delicately Yours collection are perfect for highlighting your neckline with a silvery matte finish. Geometric in their style, these necklaces come two to a pack featuring a dimensional pyramid pendant and a chevron arrow pendant that's covered in rhinestones. Including a 16 and 19-inch necklace, each jewelry piece is complete with chain extenders. 2 necklaces per package.